Late-summer/fall establishment of grass is often desired in the Midwest. 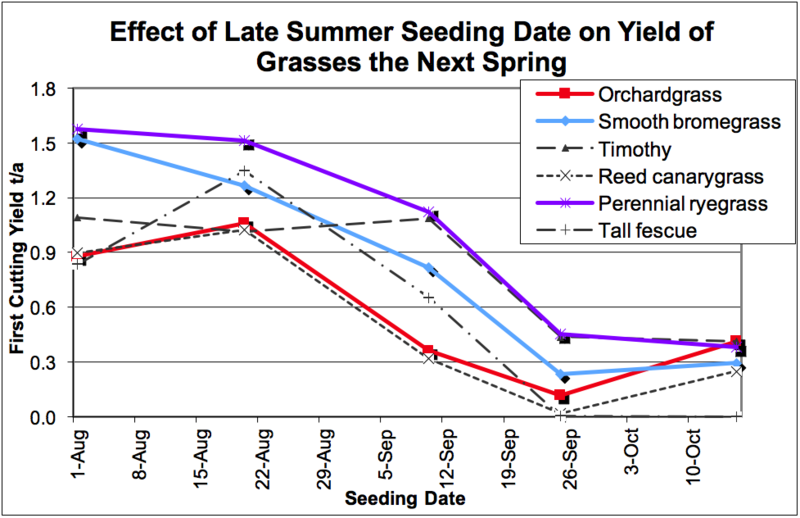 Most farmers do not realize how much fall seeding date affects the yield of the grasses the next year. We seeded six forage grasses at several late summer dates at three sites in Wisconsin (River Falls, Arlington, and Lancaster) over three years. Seeding dates were spaced approximately every 2 to 3 weeks from late about August 1st to late November 1st. Species included orchardgrass, smooth bromegrass, timothy, reed canarygrass, perennial ryegrass, and tall fescue. All the grasses seeded by mid- to late-September produced stands with visible plants before we had a killing frost most years and these plants usually survived the winter. Later seedlings did not produce visible plants until spring, if at all. Slow establishing species, particularly reed canarygrass, produced better stands when seeded by early September. Timothy tended to be the most variable regarding seeding date and next year yield. In only one trial out of nine did a November seeding, where the seed lay dormant over winter, produce a stand the next spring. The most important finding is that earlier seeding dates (early through mid-August) usually had more tillers per square foot, more tillers per plant, and higher dry matter yield the following season. As shown, in the figure below, average first cutting yields of grasses the spring after late summer seeding, when harvested at the boot stage, ranged from 1.5 t/a for some grasses down to less than 0.5 t/a on first cutting depending on when they were sown the previous fall. By later cuttings the stands had recovered and all yielded well. However, delaying late summer seeding from mid August to mid September generally resulted in 1 ton/acre less yield the next year. This study clearly shows that delaying grass seeding in the late summer or early fall not only increases the risk of establishment failure but reduces yield of the stand the next year. Therefore, we recommend seeding grasses as early as possible during the month of August.